Super Bowl XLVIII Propstravaganza! Day Four: Will FOX Talk About Pot? With Super Bowl XLVIII just two weeks away, we are all about to be inundated with ridiculous and hilarious prop bets spanning every aspect of the game day experience. In Part Four of a multi-part series, will the FOX broadcast team mention marijuana during the broadcast? Prop: Will The Announcers Say The Word "Marijuana" During The Game? The reason that this prop exists, of course, is that both the Seahawks and Broncos are from the first states in this great nation to allow recreational use of the ganj. Whether there's some kind of actual science linking legal tree blowin' to success on the football field, I'll never know, because I'm not a doctor. 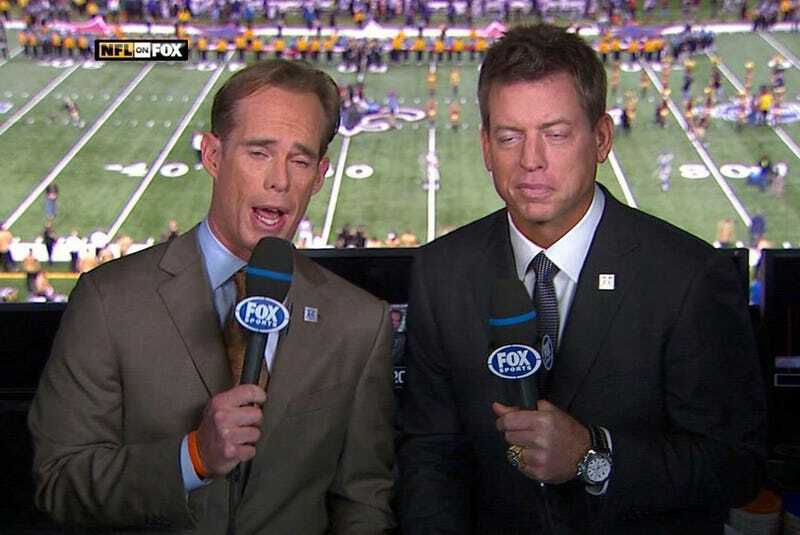 All I know is that I really hope that Buck and Aikman hotbox the booth during the game. I guess I just want this to happen, because the thought of Joe Buck or Troy Aikman saying "marijuana" in their crusty old white guy voices would be more entertaining than the Super Bowl itself. I'd record that and make it my ringtone. That is obviously not going to happen, though or, at best, is a HUGE longshot. Unfortunately, the media does pretty much whatever the NFL wants it to do, and there's no way that Roger Goodell hasn't already read the riot act to broadcasters about making the correlation that the two best teams in the NFL just happen to be from the two states where it's legal to puff, puff, and pass. So, is it worth dropping $900 to win $100 on this one? Surprisingly, I think so. The NFL is a league that suspends its players for smoking weed even in the states where it's legal, and have been pretty steadfast in their failure to adapt to the actual laws in America. Not to mention, it's not as if announcers have been throwing in the fun fact that pot is legal during either team's games this season. While -900 is a steep price, it's one of the most sure prop bets around. Super Bowl Propstravaganza! Day Three: Will Peyton Manning Retire?